Bucharest-Hotels.co.uk offers you an easy online-booking/phone support service for Bucharest hotels and provides helpful information with photos and details for each hotel in Bucharest. The comfort of a 3 stars hotel combined with the atmosphere of a guest house: a yard, swimming pool, trees and many flowers render a relaxing atmosphere after a busy day in Bucharest. Sanliv Confort Guest House welcomes you in the quietness and the execellent conditions of a 3 star comfort, which will ensure a joyful stay and the atmosphere of a home. At Casa Verde near Baneasa forest, you will enjoy the calmness never found in Bucharest. 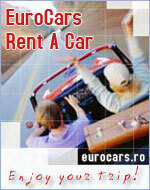 Conveniently located half distance between International Otopeni and Baneasa Airports. "La Motanul Galanton" Guest House is conveniently appointed in a lovely area in Snagov, 40 km away from Bucharest. It provides lots of entertainment: swimming or sledge riding.